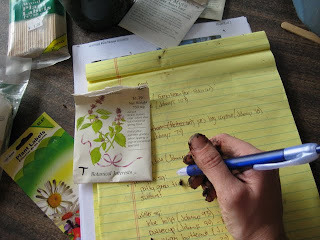 Several weeks ago we planted seeds for more than 300 veggies and flowers to be grown for CSA shares this season. 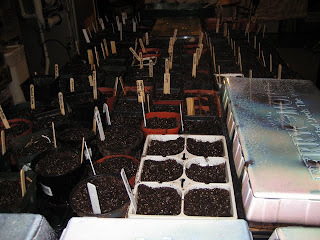 Peppers (sweet, mild, ridiculously hot), eggplant, lettuces, herbs, brussels sprouts, and over 30 varieties of tomatoes (mostly heirloom), along with bunches of annual cutting flowers, are currently getting their early start indoors. Soon I plan to post the complete list of the crops and varieties of each that we will offer this year... All told, we're growing more than 80 varieties of over 25 different vegetable crops.